Ease of installation, reliability of performance and low maintenance requirements make Maxiphase rotary phase converters an attractive solution for three phase power needs. 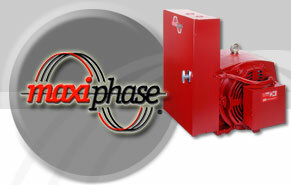 Maxiphase phase converters are available from electric motor shops, machinery dealers and electrical supply stores across the nation. Maxiphase has developed a proven product through years of experience in both construction and application of rotary phase converters. Copyright © 2003 Maxiphase, All rights reserved.